Last year, the video below was circling on Facebook. The title caught my eye, and I clicked on it. What followed was the most amazing and brave yet saddest thing I've ever watched. I've watched it 3 times, each time crying the entire way through. 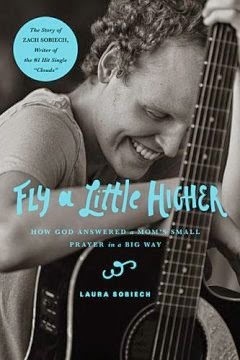 Zach Sobiech, at the age of 14, found out he had a rare form of terminal cancer. So he became a rock star, and millions of people got to see his music before he passed away on May 20, 2013. While he was sick, his mother kept a journal which eventually turned a book. I am dreading writing this review. But I have to keep my word of writing an honest review. I've read through chapter 10 and I just can't go further. Emotionally I just can't do it. Call me a wuss, call me a baby, it's all true. I've cried the entire way through the first 10 chapters and I just can't continue to do that to myself emotionally. This story is real. What their family went through is absolutely heartbreaking, and I don't want my review to take away from that. Don't let my crybaby-ness deter you from buying this book. They are amazing people with quite a story to tell.